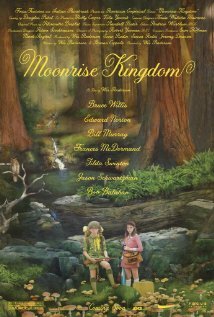 Incorporating many elements of Wes Anderson's previous films, Moonrise Kingdom might be seen, even approvingly, as the director going through the motions. It has the childhood focus of Rushmore, the dollhouse intricacy of The Royal Tenenbaums, the paradoxical criminal innocence of Bottle Rocket, the outdoor adventurousness of The Darjeeling Limited, even the documentarian angle of The Life Aquatic. To be sure, Anderson's latest instantly betrays its maker, the camera tracking and panning through an ornate, rigidly compartmentalized island home and its aloof, eerily formal child inhabitants. Set on the fictional New England island of New Penzance, this house and its surrounding locale suggest one of the director's most arch removes from the world around him, a self-contained universe of stunted genius and vague but overwhelming regret. But these same shots also display a rough quality not even evident in the director's first film. 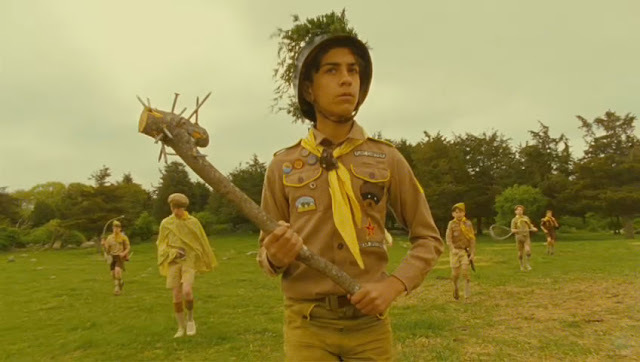 Shot on 16mm, Moonrise Kingdom's thick grain serves two main purposes. First, it aesthetically matches the film's retro 1965 setting, casting Anderson's usual world of bright, sunny yellows in dimmer, fossilizing amber and making the buildings, which look like a model village from a contemporary train set built 1:1 scale, seem lived in and worn. Second, it adds a primal, visceral edge wholly foreign to Anderson's canon, a reflection of the emotional immediacy he attains with the movie's tale of young love in open opposition to the calcified bitterness that defines so many of Anderson's frustrated, self-imprisoning characters. The aforementioned house belongs to the Bishop family, headed by Walt (Bill Murray) and Laura (Frances McDormand), two lawyers who tend to speak to each other as if they just approached the bench. One of their children is Suzy (Kara Hayward), a 12-year-old who spends her days standing atop the lighthouse tower rising from the home scanning the area with her binoculars. Like most of Anderson's characters, she is rigid and impassive, but a clear restlessness distinguishes her from her sedentary family. Meanwhile, on the other end of the island, the director introduces a Khaki Scout camp with similar formalism and remove. His camera glides over a makeshift fort and its attendant militaristic hierarchy as Scoutmaster Randy Ward (Ed Norton) walks through morning inspections and sits down for breakfast. Resembling a grown-up Max Fischer, Ward has tamed nature into a reflection of the bourgeois comfort seen back at the Bishop house. This is not a place where boys are molded into men through discipline and the elements but merely a vacation. It may be for that reason as much as burning first love that one child, Sam Shakusky (Jared Gilman), leaves a letter of resignation and cuts a hole in his tent he papers over as if in a prison escape film. Sam and Suzy meet up in a field and head out for a new life together. Sam, an orphan who's bounced around foster homes, exists outside Anderson's cloistered societies and is therefore the most liberated character in Wes Anderson's work. Just look at what he brings for their trip compared to Suzy. He packs for utility, packing the material they'll need to get by outdoors; naïve as his plan is, at least he brought the things necessary to make his dream a reality. The only extraneous item he includes are some wildflowers he picked as a bouquet for his belle. Suzy, on the other hand, packs only items of leisure: a suitcase filled with books, a record player she nicked from her brother, and even her cat, for whom she also brought a box filled with tins of food. As with the brothers of The Darjeeling Limited, Suzy wants to leave without sacrificing anything, but Sam, who never belonged to the exaggerated social cage of Anderson's world, has no trouble breaking from it. At one point, Suzy talks of how she hates her family and wishes she was an orphan because all her favorite literary characters are orphans and, to her, more special. With considerable composure, Sam replies, "I love you, but you don't know what you're talking about." In a canon riddled with comedies of manners, Moonrise Kingdom may be the director's most mannered precisely because order breaks down so thoroughly. This is true even of the grown-ups: the adult Bishops, Randy, and local police captain Sharp (Bruce Willis, doing some fine character work for the first time in ages) are all hilarious in their buttoned-down realms. But even they are flabbergasted when juxtaposed against other adult forces who make them question their behavior, such as the flippantly Dickensian foster parents who "regret" to inform the grown-ups at the other end of the phone line that they cannot invite Sam back, or the equally casual way Social Services (Tilda Swinton) recommends shock therapy for the child. Back out in the wilderness, Sam and Suzy get into confrontations with the other scouts that resemble Badlands crossed with Lord of the Flies, darkly funny violence both preserving and disrupting the way of things. The introduction of something approaching chaos also aids the drama.There's a level of tension here absent in the director's other work, a sense of danger and risk that makes Sam and Suzy's story not merely engaging but gripping. Even the soundtrack contributes to this sense of young restlessness, Alexandre Desplat's primitive but driving score of lilting but agitated plucked strings and chiming flutes weaving around classical pieces common to children's music education, such as Schubert, Benjamin Britten and Les Carnivaux des Animaux. Hank Williams fills out Anderson's pop culture quota, adding a tinge of blunt, remorseful poetry that speaks both to the yearning of the kids and the broken dreams of the adults. Best and most revealing of all, though, is a scene in which the young lovers listen to Françoise Hardy's "Le Temps de l'Amour," a pre-Mod tune driven by pared down guitar and Hardy's ethereal, beckoning monotone. These two are so young they won't even be of age for the coming youth revolution, but their erratic, uninhibited dancing only makes them more ahead of their time. Anderson's detractors accuse him of embracing the naïve, stunted, "twee" sensibilities of his characters, and they'll have more fodder than usual with Moonrise Kingdom. But this wondrous childhood perspective is alien even to Rushmore; that movie's protagonist didn't realize he was clamoring to remain in the responsibility-free zone of youth because he fancied himself wise and mature, while the kids here openly prioritize their immediate, passionate feelings over the cold dissatisfaction of their elders. Yet no Anderson film puts forward such clear insights into rich humanity. When a dog dies in the absurdist crossfire of Sam and Suzy's confrontation with the rest of Sam's scout troop, Suzy asks, "Was he a good dog?" "Who's to say?" replies Sam with almost philosophical reverence, "But he didn't deserve to die." Elsewhere, a scene between Murray and McDonald lying in those separated twin beds that represent completed marital duty is devastating in its gentle evocation of love as something that can be slowly supplanted by social responsibility. The imagery of Noah's flood factors heavily into the film, from a lavish church production in which seemingly every child in America has been recruited to represent every animal on the ark to a storm that weighs over the film's second half. The story of the flood is one of horrific destruction, but also rebirth and a fresh start, and Moonrise Kingdom concludes with a well-considered but optimistic view of good coming from bad, and of a cycle restarting with enough variations to make possible a wildly different, more positive outcome. Anderson's films end with his characters finally seeing themselves as they are and possibly bettering themselves, no mean feat considering the solipsistic narcissism of their worldviews. Moonrise Kingdom is his first film to suggest a better tomorrow for everyone. Excellent review. I hope I can see it soon.